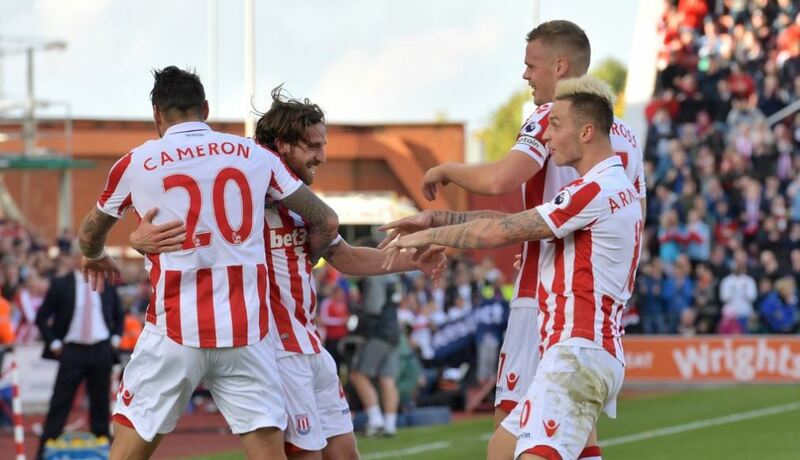 After eight games the Premier League season is already shaping up to be very different to last season’s, with the ‘fancied’ clubs already sitting near the top, whilst the promoted clubs and those who normally struggle are appear to be struggling. In this week’s blog SportsMatrix examined the level of threat posed by each of the Premier League teams in front of goal after eight games. So far the number of goals scored mostly reflects the teams’ position in the table. But when looking in detail at the number of goal attempts and the threat from these attempts, then things look somewhat different. 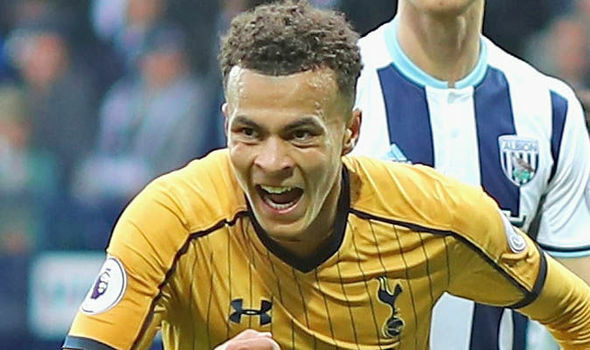 Whilst Tottenham Hotspur average most attempts on goal per game (18.9) and a slightly above average percentage of threatening attempts, their conversion rate is below the league average, reflected in 12 goals scored in eight games (their total of 13 goals includes an own goal). Even less effective in front of goal are Southampton, who average almost as many attempts per game (18.5) as Spurs, but with the lowest percentage of goals scored (6.1%) in the entire league from their attempts. Manchester City, the league’s equal top scorers, average almost as many attempts on goal per game as Spurs and Southampton, but with the highest percentage of threatening attempts (32.7%) and with an above average conversion rate of goals from attempts. Being clinical in front of goal is very important for teams reaching fewer goal attempts, with Watford and AFC Bournemouth, sitting in 10th and 11th place respectively. Whilst Watford reached a below average number of attempts on goal, they have the third highest percentage (30.9%) of threatening goal attempts and the highest conversion rate (14.8%) of any team in the League. Bournemouth average slightly more attempts on goal per game, with a marginally higher percentage (31.2%) of threatening attempts and amongst the best conversion rates (12.9%). Arsenal, second in the league on goal difference from Manchester City have reached an above average number of attempts on goal, posed an above average threat from these attempts and scored the second highest percentage of goals (13.3%) from attempts, already a significant improvement on their average of 10% of goals scored from attempts last season. At the other end of the league the three promoted clubs (Burnley, Middlesbrough and Hull City) average fewest attempts on goal. 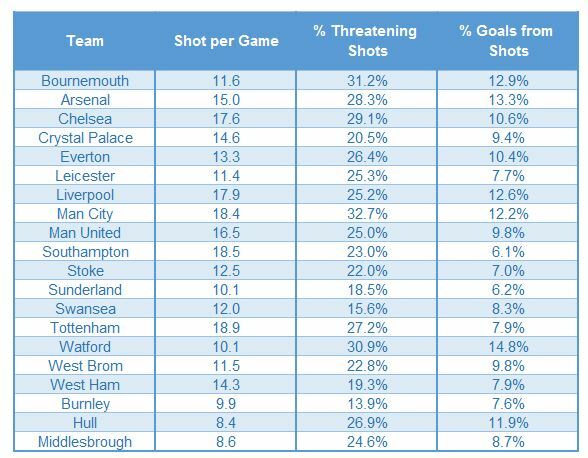 Whilst Hull and Middlesbrough’s percentage of threatening shots is close to average, Burnley by some distance average the lowest percentage of threatening attempts on goal (13.9%) and a below average percentage of goals from their attempts. But despite averaging fewest attempts on goal per game, Hull have been the most clinical amongst the promoted clubs, with an above average conversion rate. Sunderland, who already appear to be in danger at the foot of the table, have averaged amongst the fewest attempts on goal and scored equal fewest goals, but of more concern they have averaged amongst the lowest percentage of dangerous attempts and close to the lowest conversion rate (6.2%) of any team in the league. attempts on goal than average and a slightly below average percentage of threatening attempts on goal, their conversion rate has been amongst the poorest (7%). Swansea have averaged almost as many attempts on goal as Stoke, but their percentage of threatening attempts is second lowest (15.6%) in the league, combined with a below average conversion rate. Whilst there’s only so much that the data can reveal at this stage of the season, what appears to be a reasonable conclusion is that averaging a high number of attempts on goal per game is likely to be necessary for a team to survive in the Premier League, unless that team is clinical in front of goal.